The winners of the Quadrant Award 2013 (left to right): Dr. Shelby B. Hutchens, California Institute of Technology, USA, Dr. Nobuhiro Yanai (1st prize), Kyoto University, Japan, Dr. Neil D. Treat, University of California, Santa Barbara, USA, Dr. Sangwoo Lee, University of Minnesota, USA. Quadrant, a global leader in the manufacturing of high-performance thermoplastics and composites, conferred the coveted international "Quadrant Award" for the fifth time on Friday, January 25, 2013. The international invitation to submit entries for the award was addressed to graduates who had written a doctoral thesis in the field of "Materials and processes related to engineering and high-performance plastics and composites" between October 1, 2010, and September 30, 2012. Of the four prizewinners, the Japanese researcher Dr. Nobuhiro Yanai won the first prize of EUR 15 000. Dr. Yanai wrote his thesis at Kyoto University, Japan and is now assistant professor at Kyushu University, Japan. The other three Quadrant Award winners, who have won prizes of EUR 5 000 each are (in alphabetical order): Dr. Shelby B. Hutchens (USA), California Institute of Technology, USA, post-doctoral position at the University of Massachusetts Amherst, USA; Dr. Sangwoo Lee (South Korea), University of Minnesota, USA, post-doctoral position at the University of Minnesota; and Dr. Neil D. Treat (USA), University of California, Santa Barbara, USA, post-doctoral position at Imperial College London, UK. The event took place at the Swiss Federal Institute of Technology (ETH) in Zurich, Switzerland. 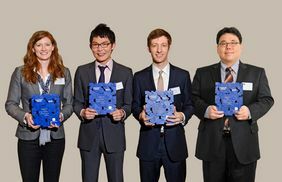 The academic jury awarded the first prize to Nobuhiro Yanai for his thesis entitled "Controlling Polymer Properties in Coordination Nanospaces" for "his development of elegant strategies utilizing metal organic frameworks to template polymeric systems and tailor their properties at the nanoscale. Formation of polymers in controlled pore geometries leads to control of many properties, such as transition temperatures in quasi-one dimensional arrays and two dimensional template geometries. Yanai tackled these problems with a creative combination of experimental and modeling approaches. Applications include tailored anisotropic conductivity, tailored ion-conductive polymers, and fluorescence switching by gas absorption. His contributions to fundamental science include a better understanding of pore size effects, and the origin of transition behavior due to guest-guest and guest-host interactions." Shelby B. Hutchens was awarded for the thesis entitled "Deformation Behavior and Mechanical Analysis of Vertically Aligned Carbon Nanotube (VACNT) Bundles" for "developing simple models to describe the deformation of carbon nanotube assemblies under mechanical stress, by combining experiment and simulation with great synergy." Sangwoo Lee was awarded for the thesis entitled "Structure and Dynamics of Block Copolymer Based Soft Materials" for "the discovery of sigma phases of block co-polymers, which combine features of crystallinity and glass-like behavior, and characterizing these novel phases exhaustively." Neil D. Treat was awarded for the thesis entitled "Organic Solar Cells: Understanding the Miscibility and Diffusion within Polymer-Fullerene Bulk Heterojunctions" for "breakthroughs in developing an understanding of how the nanoscale mixing and structure of conductive polymers and fullerene electron acceptors affects the charge transport properties critical for improved organic solar cells." Professor Dr. Paolo Ermanni, ETH Zurich, Centre of Structure Technologies, presided. He is not part of the six-member jury. Professor Rodney Priestley, Princeton University, Department of Chemical and Biological Engineering, USA, and Quadrant Award Winner 2009, also attended the event and talked about his life and career after winning the prize. The number of international entries received was very encouraging (46 in total / by university: 20 from the Americas, 9 from Asia Pacific, 17 from Europe/Africa; by nationality: 7 from the Americas, 24 from Asia Pacific, 15 from Europe/Africa). We are pleased to see that the quality of papers submitted continues to rise. In accordance with a rule change, four winners were invited to the event (previously six invitations were issued, with three winners). The launch of the international Quadrant Award is intended to reward academic excellence and to foster talent worldwide. Quadrant also aims to make a contribution in building a bridge between industry and academia. The next Quadrant Award is planned to be conferred in 2015. The award presented was designed by the internationally distinguished Swiss artist Beat Zoderer. The design of the artist's multiple is based on the artist's idea that thermoplastics can be worked in the liquid state. Liquid plastic dripping onto an object such as paper or a panel forms drops of different sizes, which also resemble the emergence of innovative ideas in the form of "drops of imagination." Beat Zoderer has translated this idea into a relief landscape of circles. The base material used was a sheet of Ertacetal C blue 50 plastic produced at Quadrant's plant in Tielt, Belgium. Quadrant is a leading global manufacturer of high-performance thermoplastic materials in the form of semi-finished products and finished parts with locations in 20 countries and more than 2 000 employees. Its specialty engineering thermoplastics and composites are superior in performance to metals and other materials and are used in a growing number of applications, primarily in the capital goods industry. Together with leaders in a wide range of customer markets, Quadrant is continuously developing new areas of application. With its strategic partner, Mitsubishi Plastics, Quadrant is well prepared to expand its market leadership position in the future.